GameStop will soon be offering Steam Wallet codes for sale in its U.S. stores. "East is East and West is West, and never the twain shall meet," except perhaps at GameStop, which has entered into a deal with Valve, parent company of digital distribution behemoth Steam, to offer Steam Wallet codes at all its U.S. locatdions. "We are thrilled to be partnering with Valve on this new initiative," said Steve "Don't Call Me Stevie" Nix, GameStop's GM of Digital Distribution. "This gives even more options to customers now that they can put money in their Steam Wallet using cash, gift cards or trade credits through our convenient neighborhood locations." What makes the deal notable is the fact that Steam is the tip of the "kill retail" spear, offering more than 1800 PC games and ridiculously good sales, all accessible from the comfort of your chair. Even retail releases of a lot of PC games these days make use of Steam DRM, which for some people makes a trip to the local store seem like a complete waste of time. So why did GameStop do this deal with the devil? Necessity, primarily. Steam isn't going anywhere, so instead of trying to beat it, GameStop is joining up, making itself an integral part of the process. True, you don't have to go to the mall to score a Steam Wallet voucher, but for gamers without a credit card [or who don't want to use it online] or people buying gifts without any clue as to what their giftee actually wants, it's a very practical option. It's also another option for trade-ins and GameStop gift cards, both of which can be put toward Steam Wallet purchases. 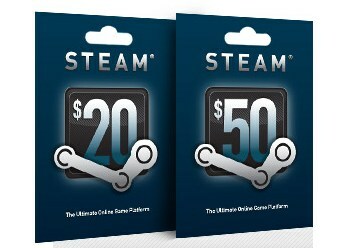 Steam Wallet codes will be available from GameStop in $20 and $50 denominations. To find out more about how it works, head down to your local store or check out gamestop.com/steamwallet.